Comrades, this year marks a momentous occasion. Its been (at least) 500 years since the expression of the basic ideas of socialism [that’s ½ a millennium for you youngsters]. Some have said that these ideas have been around since the beginning of recorded history. They were voiced in Plato’s Republic and recently (In a relative sense of the word) in Thomas More's Utopia published in 1516, and thus 500 years. See How Socialism Nearly Destroyed the Pilgrims as well as other failed implementations of these concepts. Gerrard Winstanley (born 1609, died sometime after 1660) was probably the greatest socialist thinker that the English-speaking countries have yet produced, and the Digger movement which he led was certainly the first practical expression of socialism. But it lasted only a very short time, and the same was true of the movement led by Babeuf during the French Revolution a century and a half later. Meanwhile, quite a number of writers had formulated views of a more or less definitely socialist character. There are multiple sources on this early history of socialism and in the spirit of brevity, we will just list out links for these sources at the bottom of this piece. These facts highlight one of the more ubiquitous and prevalent lies of the socialist left of any nation is that it’s ideas are fresh and new and thus untested in the unforgiving crucible of reality. Leftists love to foster the myth that the underlying concepts of their base ideology are brand new. They are supposedly revolutionary in character that can work because they are new and untested. Anarcho-syndicalism, Bolshevism, Castroism, centralism, commonweal, communism, common ownership collectivism, cooperative society, collective ownership, communalism, Fabianism, fascism, guild socialism, heteronomy, kolkhoz, Leninism, liberalism, managed economy, Maoism, Marxism, Marxist-Leninism, national socialism, neofascism, ochlocracy, phalansterism, public ownership, rule of the proletariat, social justice, Stalinism, statism, state ownership, syndicalism, totalitarianism, Trotskyism, utopian socialism. The left is intellectually bankrupt because its foundational concepts have failed to work for at least ½ a millennium. It’s almost become redundant to refer to Lying leftists – and to quote a certain commercial refrain “It’s what they do”. And strangely enough, their recent electoral trouncing has made them double down on their insanity. In a manner of speaking, this should be good news for all, for instead of renouncing what has been 500 years of failure they are now going to marginalise themselves even more. It’s failure is at such a point that it must arbitrarily change the meaning of common words to alter the reality of it’s existence. These definitional lies are almost a cottage industry on the left starting with the meaning of the word ‘socialism’. They’ve vaguely defined words that imply a positive intent and turned them into meaningless gibberish. Their self labeling as “Progressive” is virtually meaningless. Webster definition: Progressive: One believing in moderate political change and especially social improvement by governmental action. Contrast that with other ideological definitions that set forth specific terms and meanings. And don’t even get me started on the absurdly undefined phrase ‘Social Justice’. The history of socialism is one of the same basic concepts failing to work time after time down through the centuries with each new iteration being labeled with another term to hide this failure. Each time someone conceptualizes the same soul crushing collectivist ideas they are said to be fresh and on the cutting edge. The nation’s Socialists on the left love to perpetuate the this myth because these brand new theories are outside the realm of accountability. But each new version of the same very old ideas has the same deadly result of abject failure, leaving the leftists with the only option of lying through their teeth on just about everything connected to their base ideology. Next year, 2017, will mark 100 years of Russian Revolution. A century of failure if there was one, across the planet. The left is in retreat or on the run everywhere. Hard-line socialist regimes are crumbling, communist countries in Asia have adopted capitalism, the political right is gaining ground, the leftist media has no credibility, and the Democrats are in disarray. It's quite symbolic that right around this time Fidel Castro dies and Donald Trump becomes U.S. president. The left is back to square one in their game of socialist monopoly. Excellent! Now we have something to keep us busy for the next hundred years. Hey, it beets beats getting a job and minding our own business doesn't it? Now we have something to keep us busy for the next hundred years. Indeed, comrade! We are at our glorious best when we are in opposition. Progress is all about destroying things, not building them. Whenever we progs win, we run the economy into the ditch and then we start blaming each other, setting up purges, show trials, and executions. Then we run out of other people's money and let the capitalists to fix things for us. So it's better for the movement never to win. Let us always remain in opposition. It's a win-win: the capitalists will create wealth, ensuring our comfortable lifestyles and creating more tools for us to hit them with. The more wealth they create, the more other people's money we get to control by griping about economic inequality. A hundred years of failure... Oh how the seasons go by! A hundred years of failure... And they said it would never last... It is to laugh. Ha. Also Ho. yeah, 2017 = 1917 + 100. And really interesting: what (neo-)bombast will Putinstan roll out, all year round? What will other Socialistans do, around the Globe? And, heh heh, lefty of Amerikkka? The left is back to square one in their game of socialist monopoly.I can well imagine that the nation’s socialist left will once again ignore the 100th anniversary of the glorious people’s revolution that ushered in that worker’s paradise. I’ve even had leftist on the national socialist left even deny that the USSR was socialist. The Democratic Party Establishment Is Finished — What a joke. — The Democrats will now control next to nothing above the municipal level. Donald Trump will be president. We are going to be unpacking this night for the rest of our lives, and lives beyond that. And the fact that they want to double down on failure is just a bonus. The decimation of the Democratic Party, visualized http://wapo.st/2fVuhkU? Help advance the totalitarian superstate in your spare time with our new TCP Utopia City Construction Kits™. The Ministry of Truth will provide updates as new kits become available. Watch Utopia City grow and spread throughout your hovel as weeks, then months of construction help guide all family units down the path to a Glorious Next Tuesday™. This building kit is totally inaccurate. Where are the drones? The collective farms? The iron mines? The vodka truck delivering vodka rations? And two thoughtcriminals have escaped in this kit. This is preposterous! It is IMPOSSIBLE to escape from a hastily-constructed wood box buried 6 feet underground. we had it already here in Kube, freshly baked (mid November), with charming Putout-Input ! That Breitbart piece is A1, indeed. a thought, that M, pushed by the all-encompassing leftish mindset here, takes those idiotic steps (2011 : quasi-dictated "Energiewende", towards "100%" wind/solar ; 2012 and counting : lawless financial "rescues" for off-the-rails Greece & Co ; 2014 through 2015 : lawless migration madness) with a silent calculus of getting "the masses" riled up to such an extent that they turn decisively against all that leftish utopianism, dirigisme, and widespread speech & thought "verbote" via PC and "activism". I give that flash-intuition some fraction of per mille ‒ practically 0 ‒ chance of being true. But, otherwise, it's really the only alternative to the conclusion that the ruling elite is far-far-far-out-of-touch with reality. The pic of positions taken by our betters is ‒ roughly ‒ similar to (pre-Trumpian) Amerikkka : conservatives dominated by RINOs (and Merkel is a super-RINO), and the rest leftish anyway. A visual glimpse of that lanscape is here. There is a single (only 3 years old) and already effective counterbalance, the AfD (Alternative for Deutschland). In Ami terms, it corresponds to the wave carrying Trump. Effects are already seen (besides AfD getting represented in state parliaments) : vee haff elections in fall 2017, an equivalent of Nov. 8th in Amiland-2016. And conservatives, pushed by AfD, already copy their appeal : want to cancel double citizenship, deport rejected "asyl-seekers", pushback against PC, stop the "Gender & Co" madness in academia/education, etc. Comrade Dummkopf, indeed was it not that Hero of the Motherland, Comrade Itzak Nevton, who said that for every proaction there must be an equal and opposite reaction, often accompanied by perpendicular middle finger? P.S. oh, your paws, your paws on the keyboard... Isaac (not an, uh, Itzig), and Newton :-) . Comrades Offline RedDiaperette and Dummkopf - you are both inkorrekt. The korrekt spelling is Eessaak Nyooton. And the Motherland's equivalent of Nyooton's perpendicular middle finger is the fig (figa, dulia). Of course, due to the korrupting influence of the dekadent Amerikkkan movie kulture, the middle finger is now also in use. 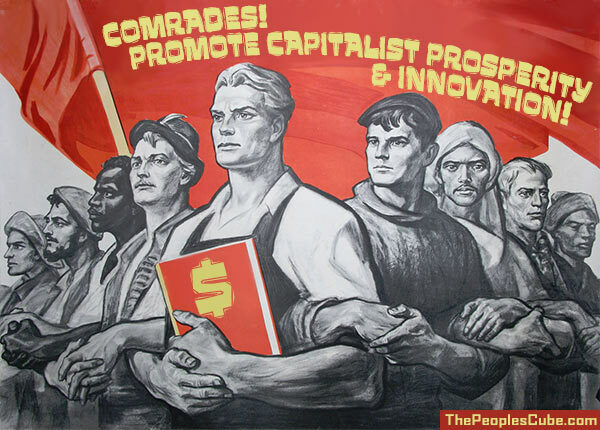 So the toiling proletarian masses now use both - two for the price of one!